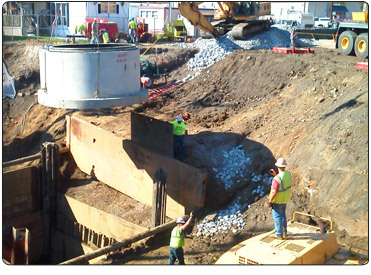 Rudzik Excavating, Inc. has the ability to complete large-scale site work projects for both developers as well as private and public landowners. We can provide value engineering and budgeting in addition to surveying, layout, final grading, and hydro seeding. We have the professionally maintained equipment and skilled operators required to meet the restraints of any site development project. Rudzik Excavating, Inc. realizes that the excavation portion of any project sets the foundation for how the project will run. To be successful, we provide highly trained personnel with the proper equipment essential to satisfy all of your site excavation needs. The efficient scheduling of work force, equipment, and resources allow us to fast track the excavation and dirt work portion of any project. Rudzik Excavating, Inc. specializes in the installation of water, storm, and sanitary underground utilities. Our crews are qualified on emergency repairs, open-field pipe installation project, as well as working in the confines of an inner city retrofitting project. We have the experience needed to complete complex boring and casing projects as well as directional drilling projects. At Rudzik Excavating, our approach to every job regardless of size is a commitment to quality service, dependability, and integrity. We strive to exceed our customers’ expectations while maintaining the highest of standards for work place safety. We provide complete site planning & development, from the initial surveying and layout to demolition, site clearing, grubbing, excavation, site utilities, concrete, paving, and restoration. At the core of Rudzik’s success is the dedication of our employee’s commitment to the quality of their work and exceptional customer service. We believe our highly skilled employees are our strongest asset.